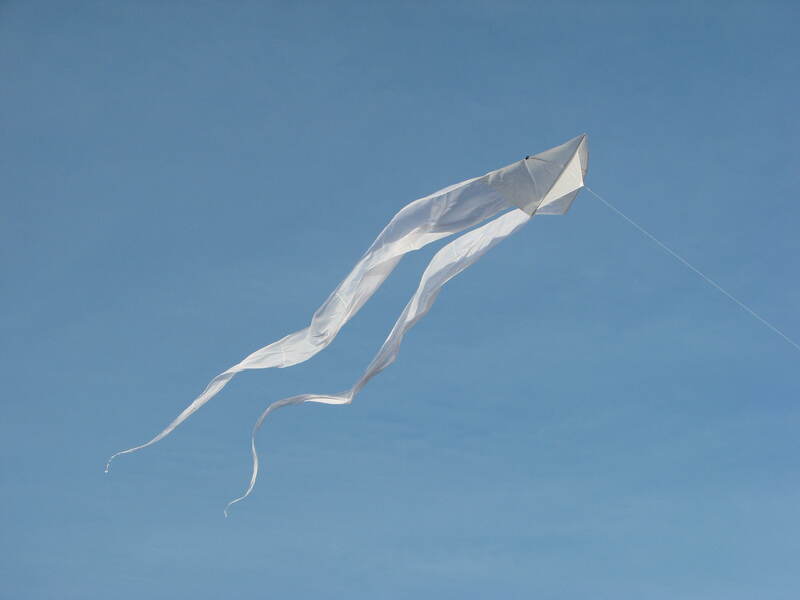 You are currently browsing the tag archive for the ‘dragon kite’ tag. 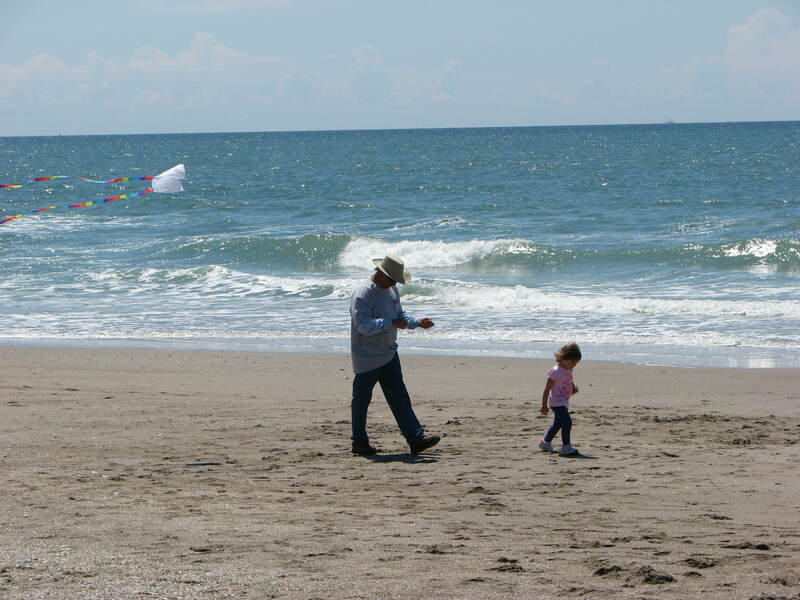 Father’s Day turned out to be a beautiful day to fly kites on the beach. The temperature was lower than the past days. The humidity dropped markedly and the winds were perfect. 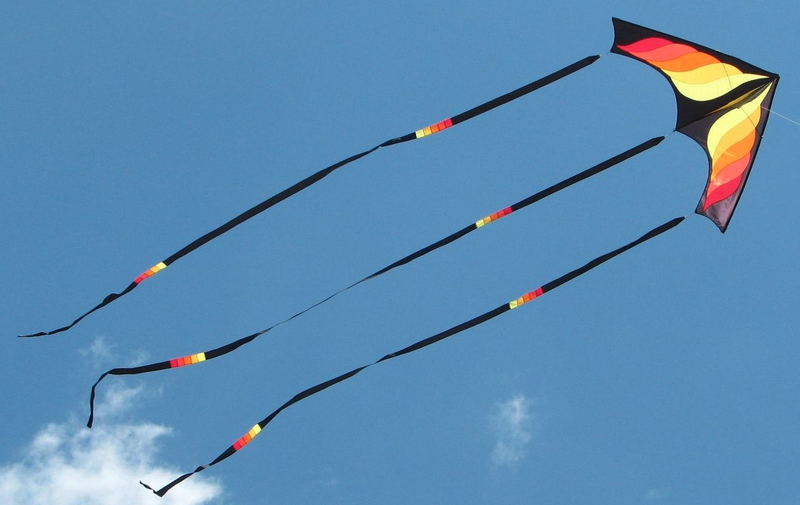 Well, actually they were a little higher than predicted but still perfect for the new and larger kites we planned to fly. 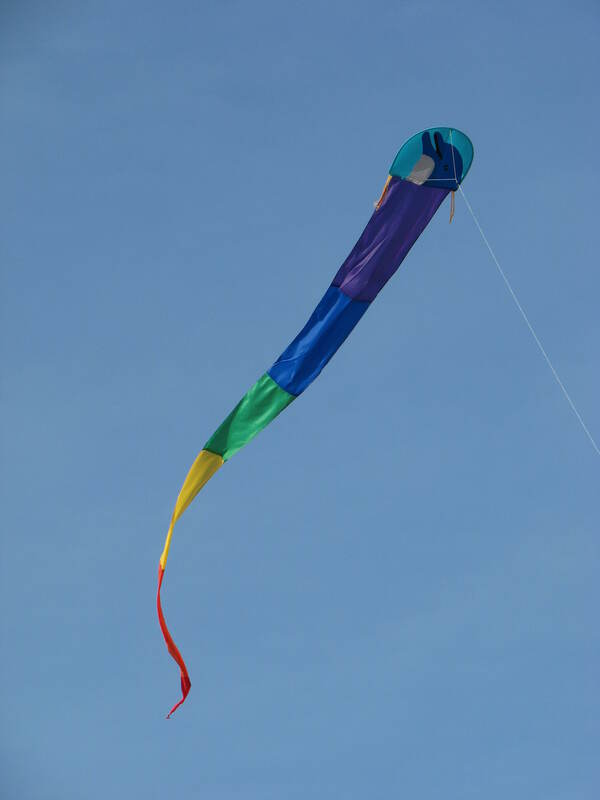 We brought one of the two kites my husband received for Father’s Day. 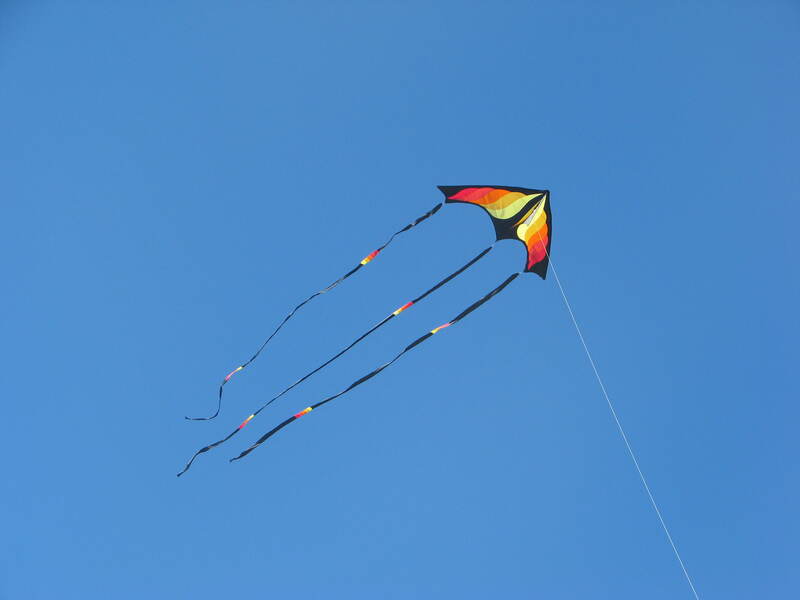 He had said weeks before that he liked a butterfly kite. 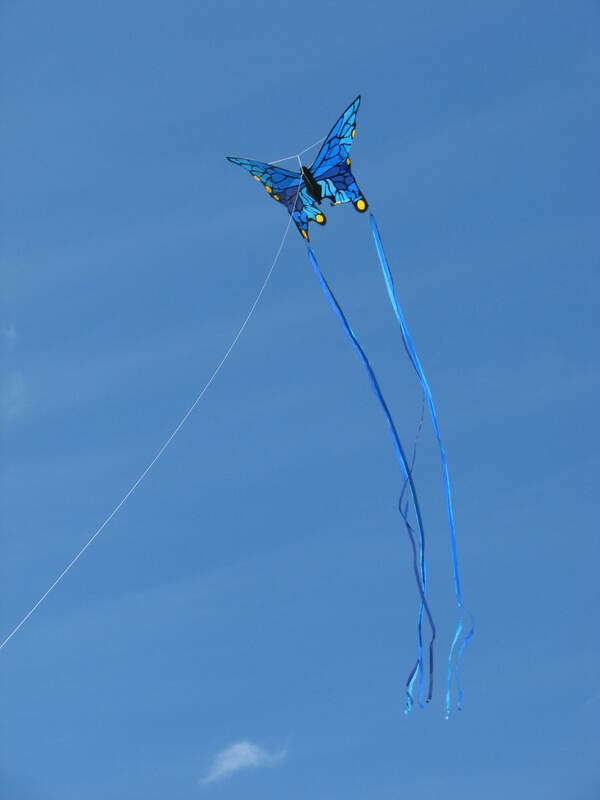 So today he flew his own blue butterfly kite. 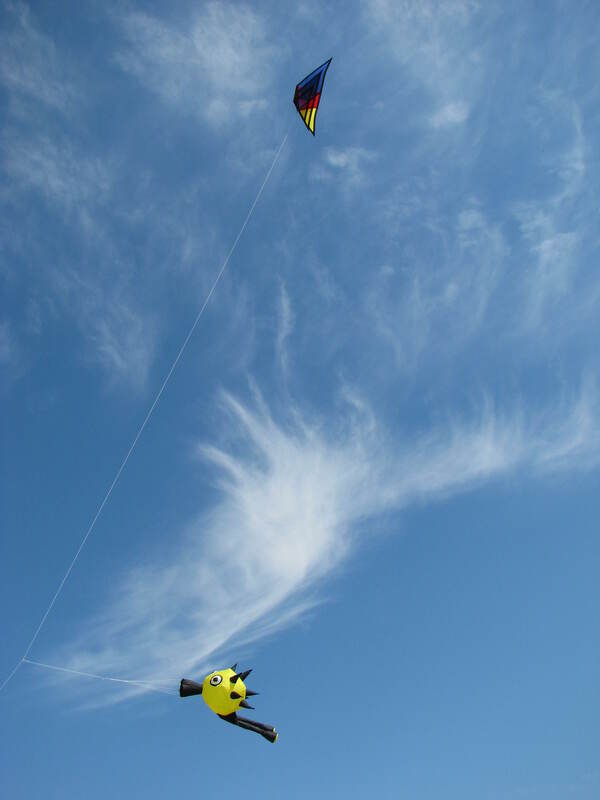 The slightly higher winds were perfect for the two larger kites we wanted to fly. 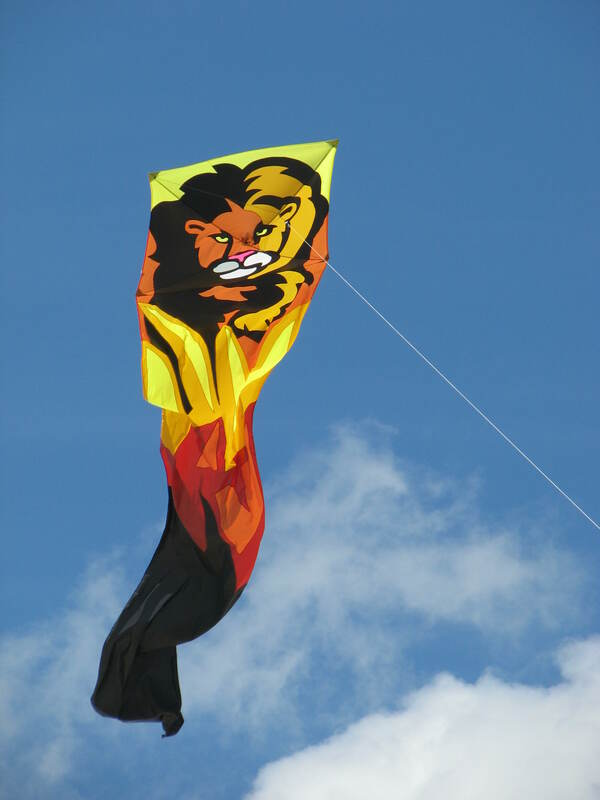 The first was the large skeleton kite that is a new release by Premier Kites this year. 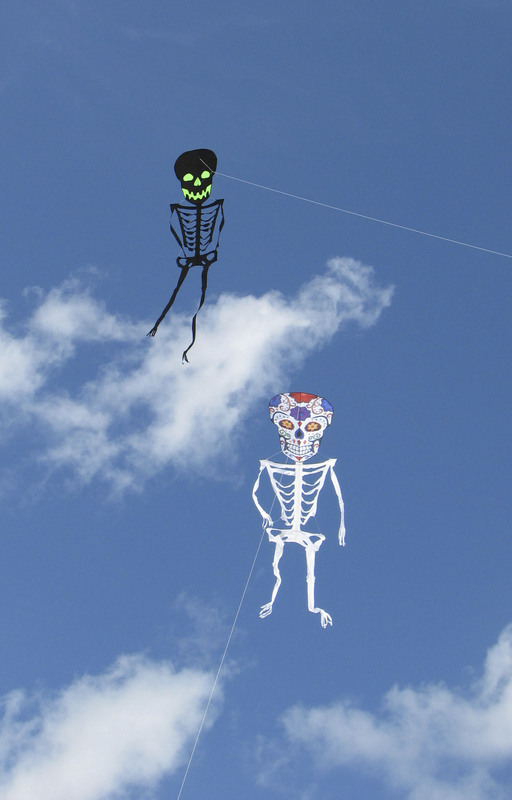 They have three styles of skeleton kites in two sizes. 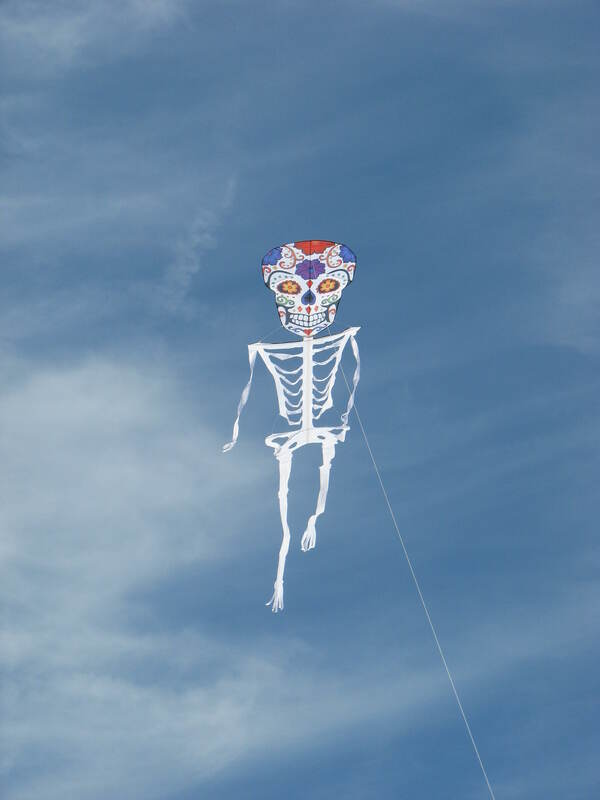 While I don’t normally go for big kites, on a whim, I did get the larger of the skeleton kites. After seeing it in the sky, I’m glad I did. 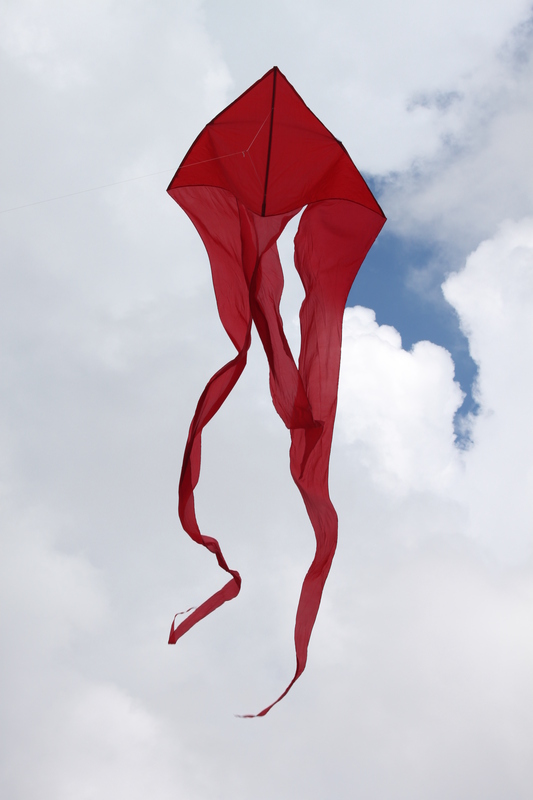 The other kite was a one that has been in our bag for two years without being flown. 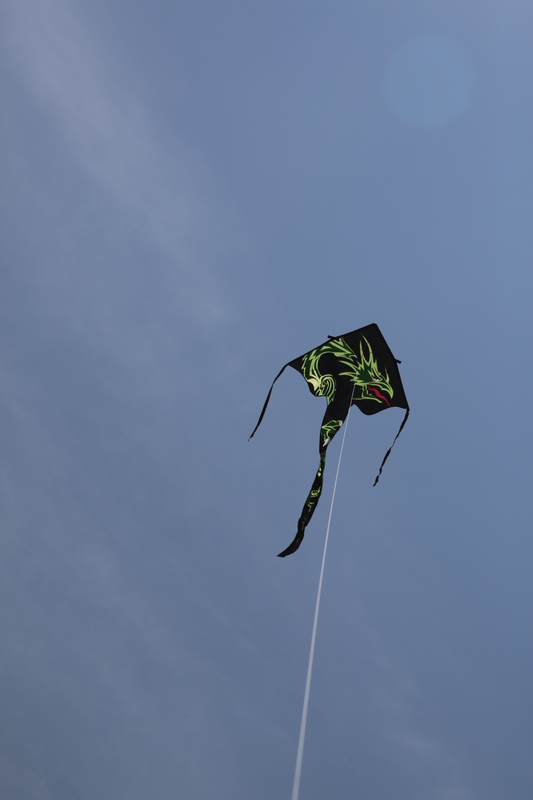 It is a square-headed dragon kite with a lion motif. 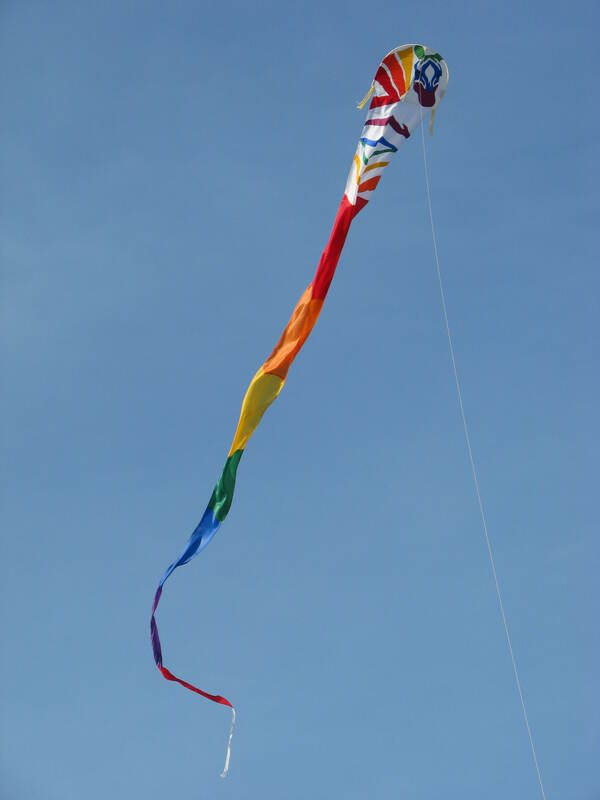 It is a beautiful kite made by Go Fly A Kite, a company no longer in business. 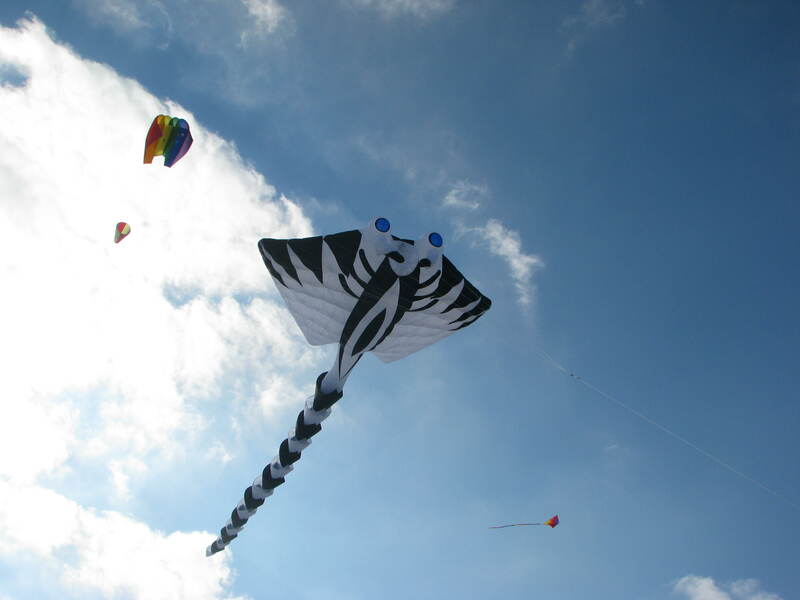 Don Dixon of Kites Unlimited just happened to bring along the black skeleton in the smaller size. 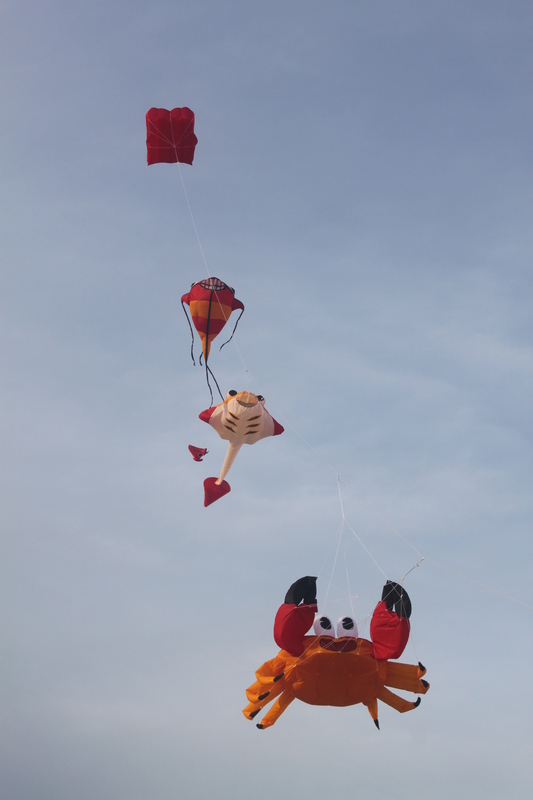 It took a little maneuvering but we got both skeletons to fly next to one another without tangling. They looked pretty good together. 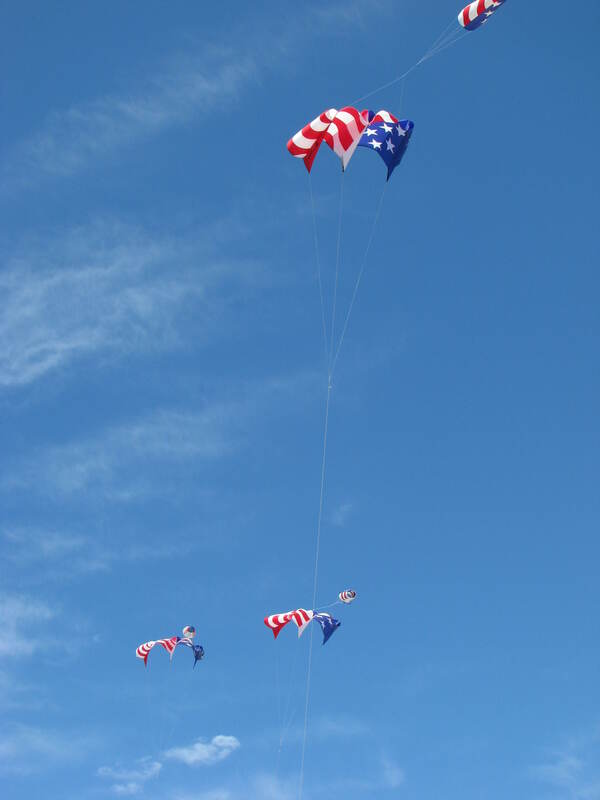 All the single line kites were flying so well, I took the opportunity to get my full-vent Kites Unlimited Rev out and get some much-needed practice. And someone else took advantage of the fact I put the camera down. I’ll have to be more careful where I leave it next time. 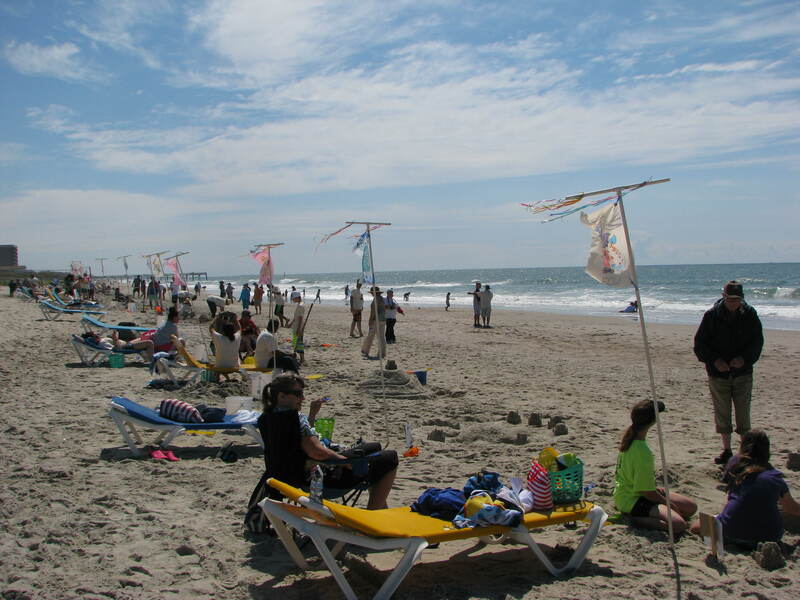 The Mile of Hope is an annual weekend on the beach for families with children who have cancer. It is sponsored by the Optimist Club of Raleigh, NC. 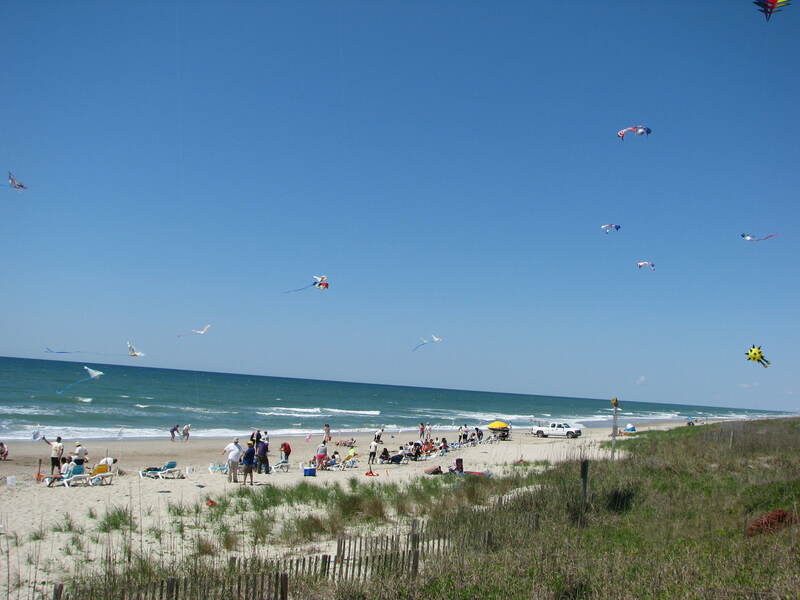 Twenty-five families spend the weekend visiting area attractions, going on a sightseeing cruise and spending time on the beach. 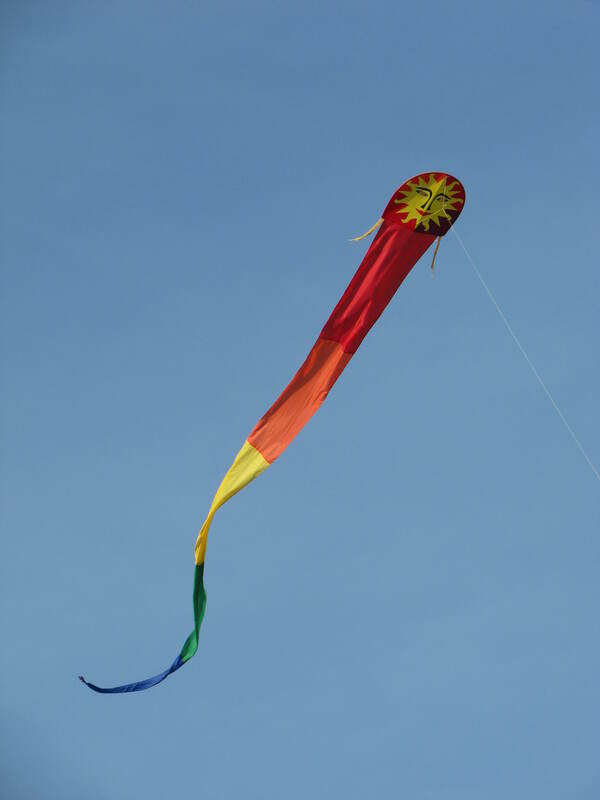 It gives them a chance to get away from the routine of hospital stays, drug treatments and therapies. Saturday morning is beach time. 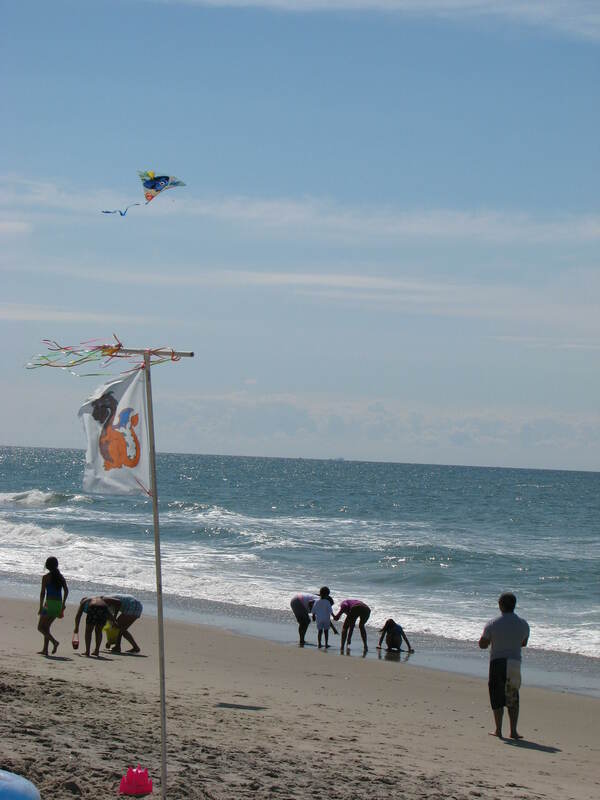 The families spend time on the beach wading in the water, building sand castles and flying kites. 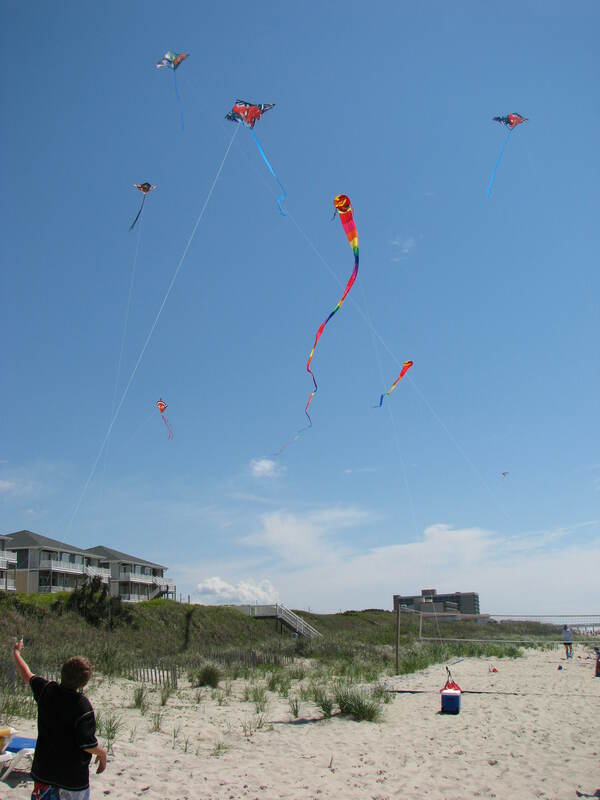 Kites Unlimited of Atlantic Beach provides kites for all the children. 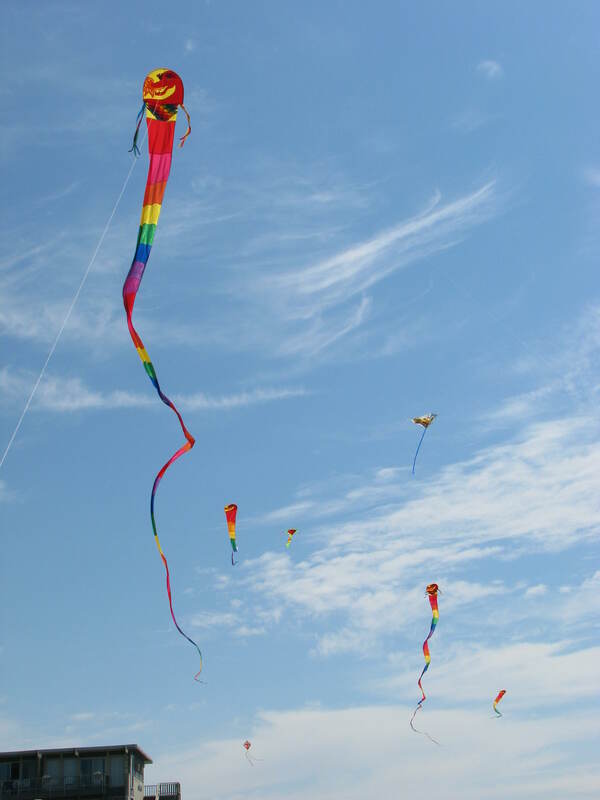 The Carolina Kite Club members bring some of their “showiest” kites and fill the sky with color for all to enjoy. 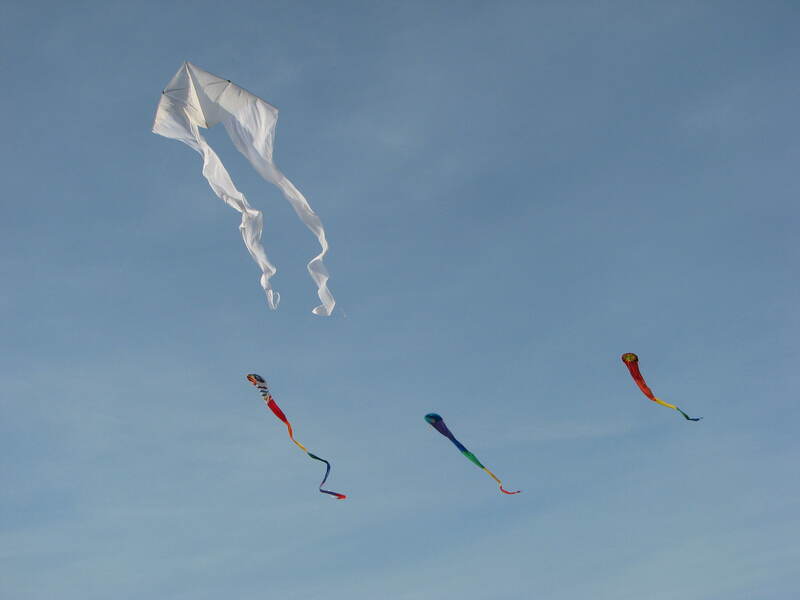 We’re also there to help the children get their kites in the air and solve any problems they might have. 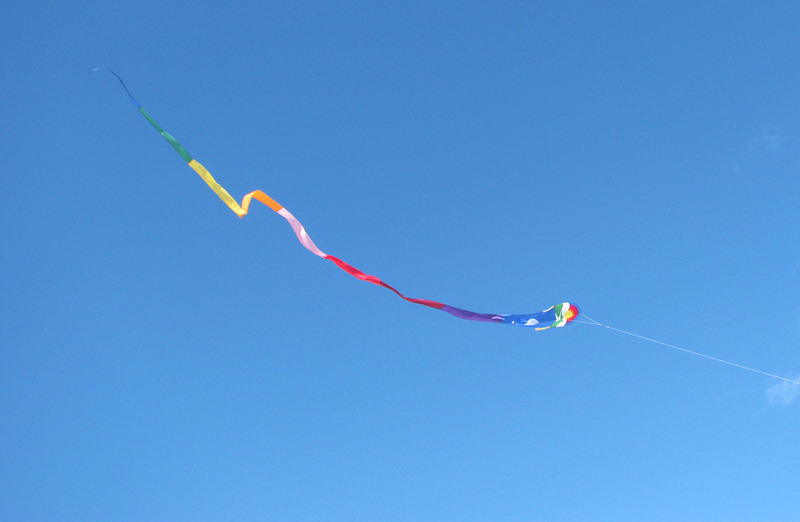 This year was one of the best years for the kite fly. 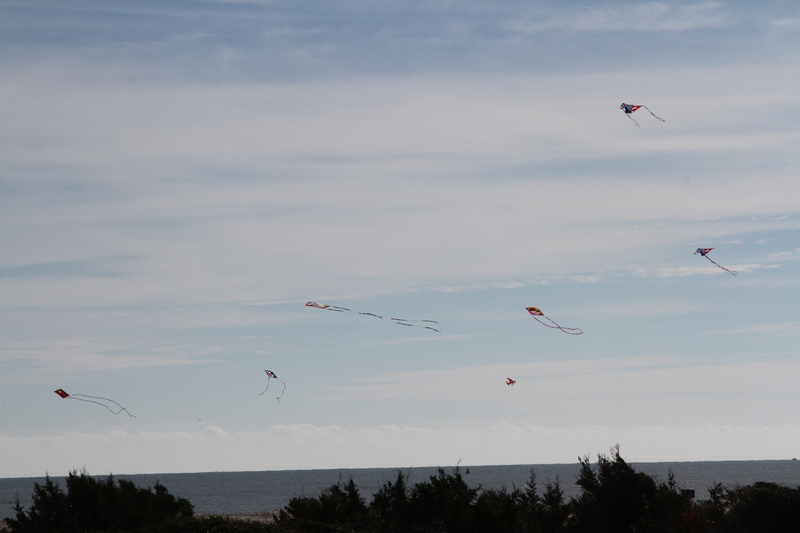 The winds were moderate and directed down the beach (no obstructions), the sun shone and the temperatures were mild. 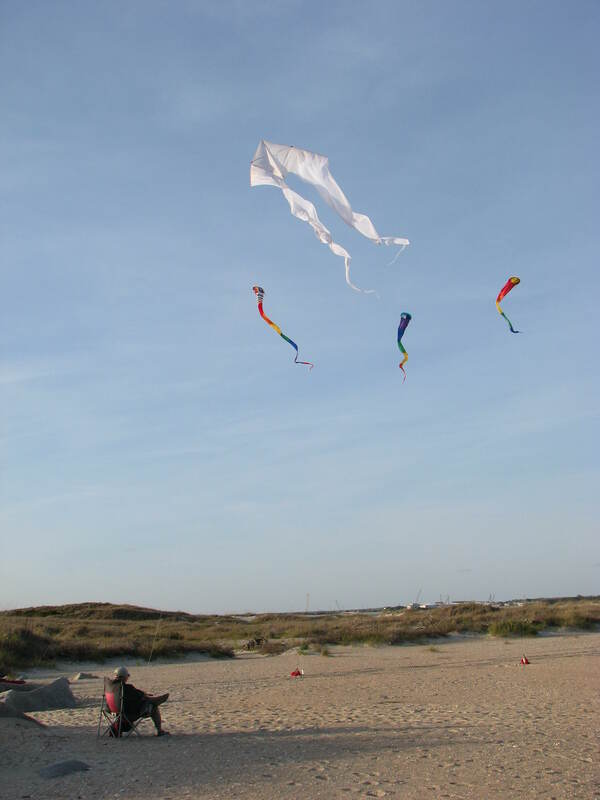 All kinds of kites were in the sky; dragon kites, critter kites, power sleds, delta kites, a Legs kite, and a Triangulation. 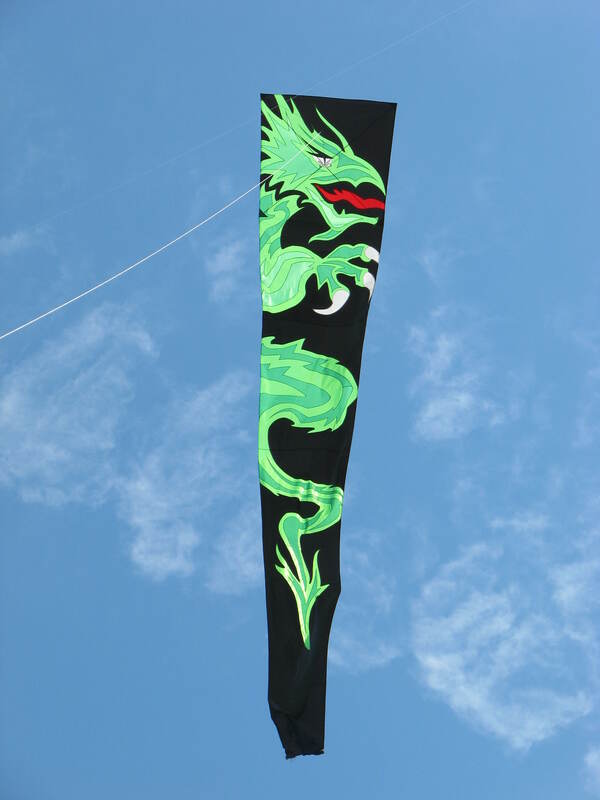 The theme of the weekend was “dragons” so we made sure the big green Skydog Dragon was in the air as well as the large White Bird “Friendly Dragons” and their accompanying smaller “Friendly Dragons”. By the end of the morning, we were worn out from walking up and down the beach. But it felt good to see the smiles on the children’s faces and hear their laughter as they played in the sand. And looking around, you could see that the adults were having just as much fun as the children. 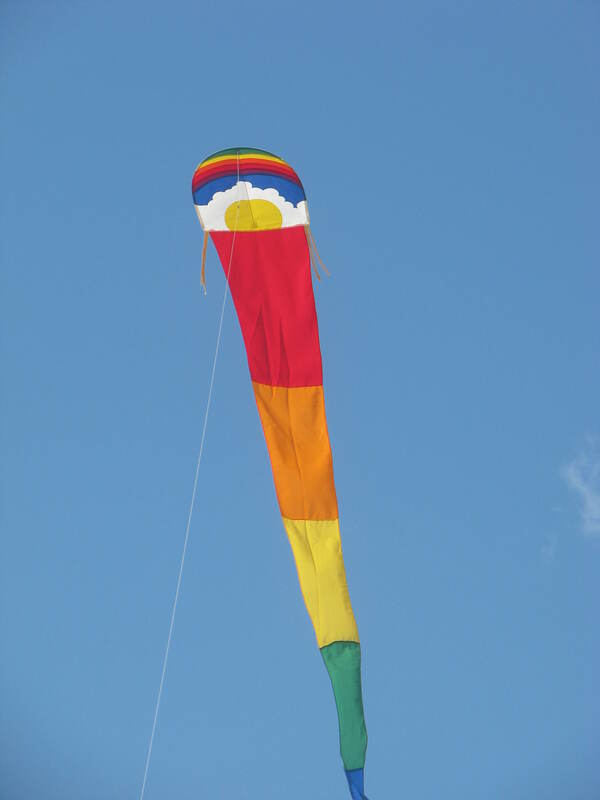 The club kite fly this week was called because of weather. We have become weather wimps in our “old age”. 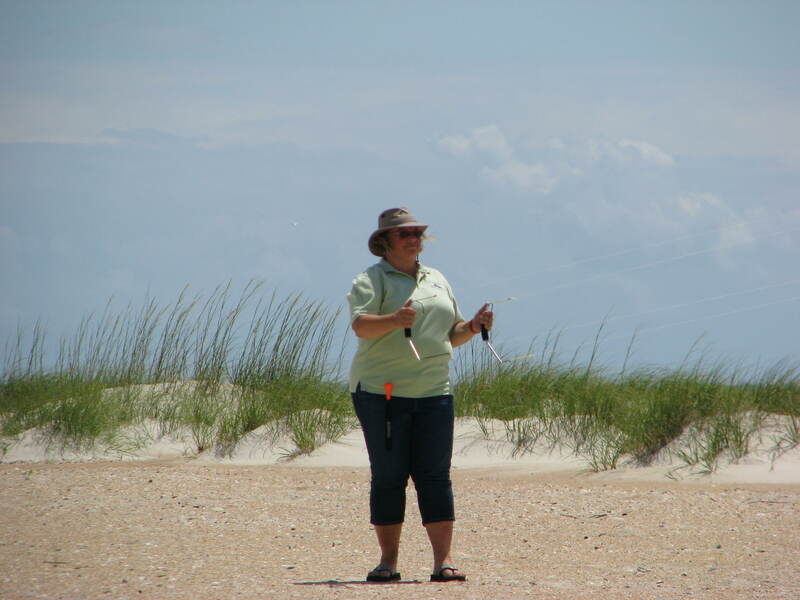 However, the call of our addiction was so great that we went out on the next pretty day and had the beach to ourselves. 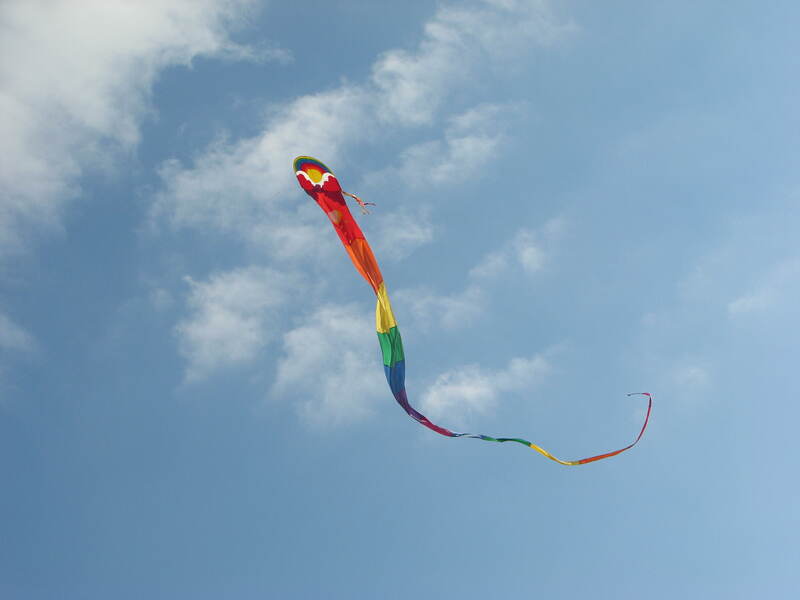 We went “back to our roots” and flew only single line kites. 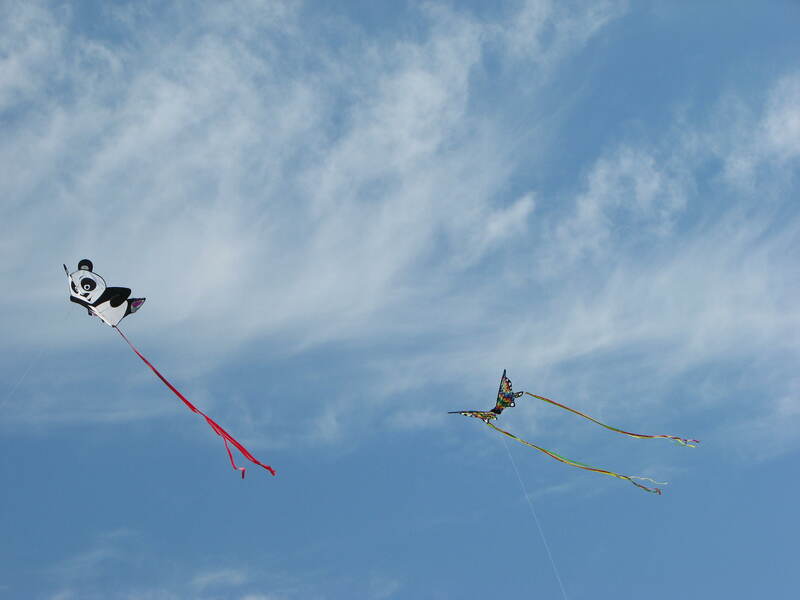 My husband put up his Ghost Delta and I selected some of my White Bird dragon kites. I’m continually trying to expand my collection of White Bird dragons. These were three that you don’t see too often. 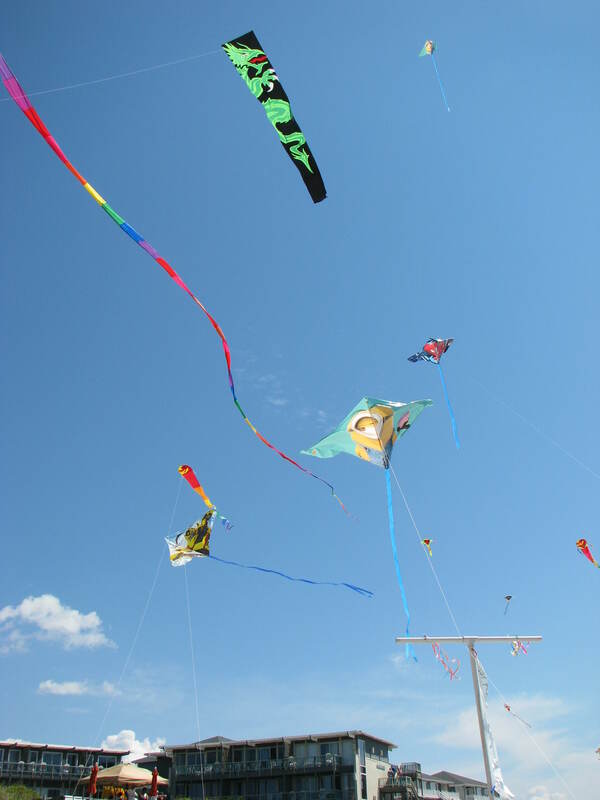 They put on a show in the sky no matter what pattern in on the sail. 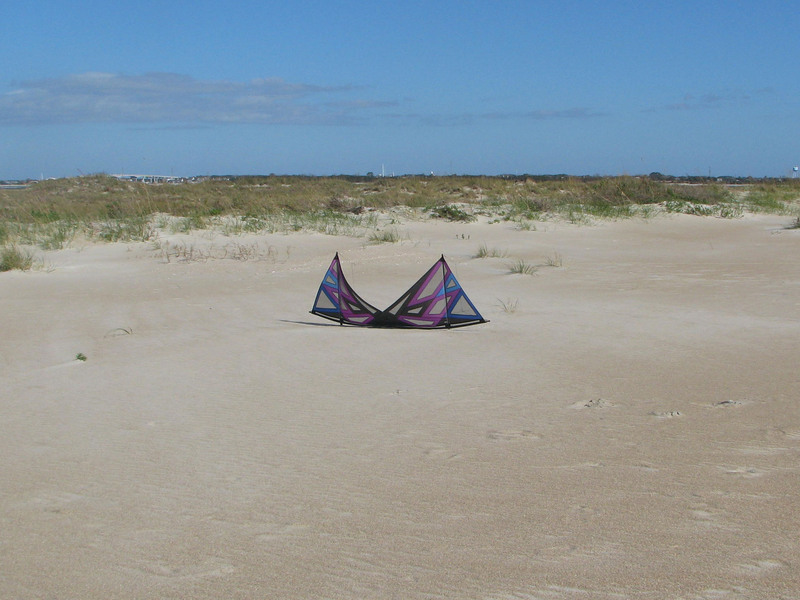 The Ghost Delta is made by Gomberg Kites. It comes in other colors but the white seems to be the favorite. Like the dragons, the flowing tails really make a statement in the sky. Flying in the evening is a relaxing end to any day. As the sun went down and the air began to chill, we packed up and strolled to the truck. 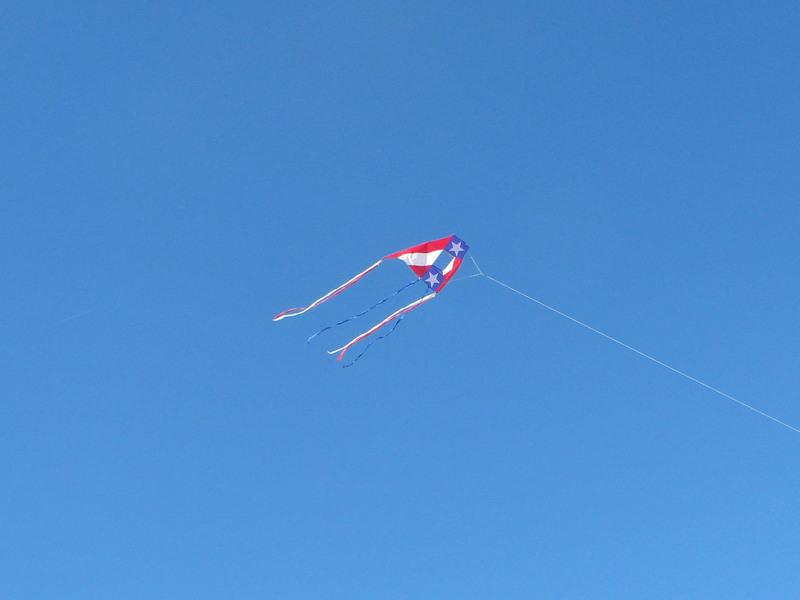 We were already making plans for our next flying day.